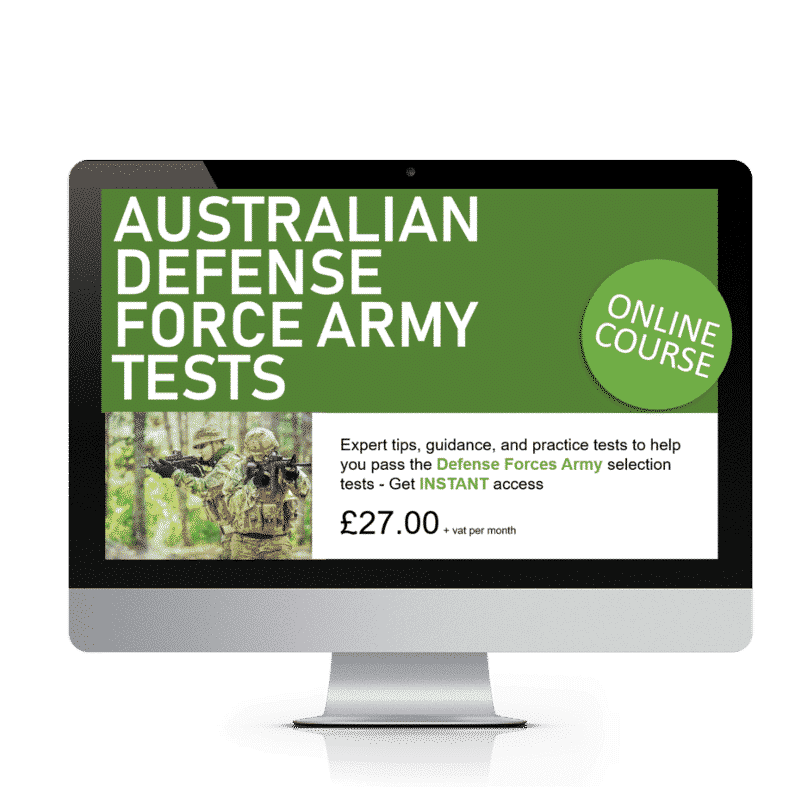 In the Australian Defence Force Army Tests online course, you’ll receive everything you need to effectively prepare for the Australian Defence Force selection process. Candidates are tested in a variety of areas, from physical fitness to mental aptitude. There’s lots to prepare for. So, you’ll want all the help you can get in order to maximise your chances of passing your Australian Army Aptitude Tests. What is the Australian Defence Force? With nearly 60,000 active personnel, the Australian Defence Force is responsible for protecting Australia’s interests internationally, as well as providing domestic security and disaster relief. In particular, the Australian Army is Australia’s ground force when it comes to military presence. So, while Australian territory hasn’t been under direct attack since the Second World War, the Australian Army has been present in a number of conflicts, such as the Vietnam War, Rwanda, the War in Afghanistan, and the Iraq War. Consequently, it’s clear to see that the Australian Army plays an active role in world conflict and peace-keeping efforts. Recruitment Process and Eligibility Information, so you can find out what you need to do before even beginning your application for the ADF. Practice Maths Questions, so that you have the best chances of success when it comes to the Australian Defence Force Maths Test. IQ Test Sample Questions to give you an idea of what questions will appear in your IQ test paper. Fitness Test Advice and Tips, so that you can make sure you are ready for the physical elements of the Australian Defence Force Army Tests. A Guide to Getting Army Fit, focused on giving you some top tips and exercise guidance so that you can make sure that you meet the Australian Army’s fitness standards. Bonus Content: The Bleep Test – instructions and materials for performing your own bleep test to help you get army fit. Defence Forces induction fitness tests are made up of three components that you will need to pass. *Female applicants who fail the fitness tests may have the opportunity to join the Army Pre-Conditioning Program. Your BMI will also be measured, so before you sign up you should ensure that you fall within the allowed range. A BMI between 18.5 and 24.9 is considered healthy. Therefore, the range you should fall in to join the Army is between 18.5 – 32.9. However, always remember that BMI does not differentiate between muscle mass and fat mass and it is not a perfect formula. So, it’s common to have a BMI that falls outside of the ‘healthy’ range without being underweight or overweight in terms of body fat. This can be due to a number of factors. For example, a highly muscular physique may result in a BMI over 25, but this is due to muscle mass and not excess fat. To find out your own BMI you will need a tape measure and weighing scale. Begin by finding out your weight in kilograms and divide that by your height in metres. Then divide your result by your height in metres again, this number is your BMI. Sample questions for the maths and IQ tests, which will allow you to prepare as much as possible for your Irish Army tests.